Large Animal Bellows Dryer - JD Medical Dist. 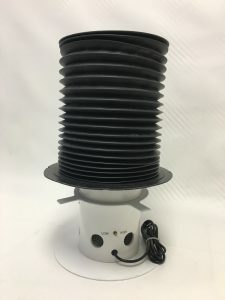 Co., Inc.
For many years customers have asked us to develop a bellows dryer to use in place of hanging the bellows on an IV pole which can bend the bellows plate and reduce the life of the bellows. 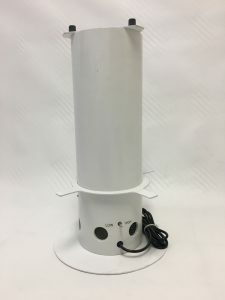 JD Medical has developed a 2 speed bellows dryer that you can place your bellows over the top and the frame of the dryer allows the bellows to sit flat and it also allows the bellows to extend thus allowing circulation on each convolution to dry. The ambient air is drawn from the bottom holes around the base of the unit and it is then forced upward to the top of the bellows and then it follows the path of least resistance and exits at the bottom. Cleaning/disinfecting and drying the bellows is a very important part of reducing cross infections between animals.